Beat the eggs and some sea salt in a bowl until frothy. Heat a skillet over medium heat and add a chunk of clarified butter. Add the potatoes and a generous sprinkling of salt and cook until browned. Add in the chopped leeks. Toss until the leeks are wilted and soft, about 1 minute. Remove from heat. Heat about 1 tablespoon of clarified butter in an omelette pan or small heavy skillet over medium heat, swirling to coat the sides with the butter. Add the beaten egg and allow to cook for a bit, undisturbed, until it starts to set. Lift up the edges of the omelette and tilt the pan to allow the uncooked egg to spill under the cooked portion. Very carefully slide a thin metal spatula under the omelette and flip it over. Turn off heat. Pile the cooked potato and leeks onto one side of the omelette, sprinkle with the cheese, and a healthy dose of black pepper and fold the omelette over to cover the filling. Place a cover on the pan to encourage the cheese to melt. 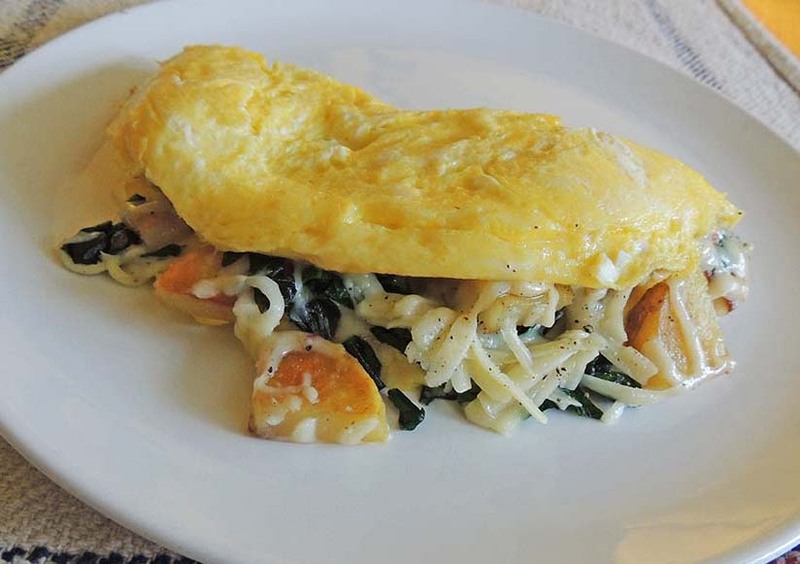 Once it’s melted, carefully slide the whole omelette onto a plate. Eat!